The air outside this factory in Northeast Philadelphia once smelled of cookies. But the aroma, along with the 350 workers who for decades made Oreos and Ritz crackers disappeared last year when snack food giant Mondelez decided to close the plant and shift production elsewhere. “It’s terrible, we have so many companies shutting down,” Art Millevoi said. Across the street from the now abandoned factory, the owner of Millevoi Auto Sales and Service recalls how friends have lost work in recent years. Philadelphia was one of the first major industrial cities in the United States, home to manufacturing plants, foundries and refineries. The eastern U.S. city has struggled with economic growth, however, ranking 250th in a recent Brookings Institution report assessing employment and GDP of the world’s 300 largest metropolitan economies. As Millievoi stands in his auto body shop, U.S. presidential candidate Donald Trump can be heard on a nearby television railing against trade deals and globalization. “NAFTA was the worst trade deal in history, and China's entrance into the World Trade Organization has enabled the greatest jobs theft in history,” Trump said. For her part, Democratic presidential candidate Hillary Clinton voiced support for the Trans-Pacific Partnership trade deal in 2011 as secretary of state, though last year on the PBS NewsHour with Judy Woodruff, Clinton said, "What I know about it, as of today, I am not in favor of what I have learned about it." In Trump's June 28 speech in the small western Pennsylvania town of Monessen, the Republican candidate appealed to working class voters — promising to keep U.S. factories open and workers employed. The message resonates with Millevoi who says he likely will be forced to shutter one of his many Philadelphia area auto centers due to rising taxes and regulatory fees. He says the government should do more to support small businesses and keep American companies like Mondelez from shifting their operations overseas to countries like Mexico. 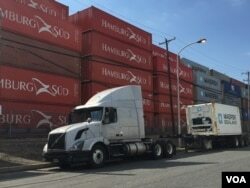 Just 20 miles south of the Mondelez plant, the scene couldn’t be more different along the Delaware River, as truckers pick up cargo containers at the port on a busy Wednesday morning. Amid the hustle and bustle of factories and cargo ships lies Frank’s restaurant serving up breakfast and lunch to truck drivers and longshoremen in Philadelphia since 1910. Owner Joe Trocino, whose father bought the place in 1966, says business has gone up and down with the economy over the years. Despite all the national talk of trade and globalization spurred by the Britain’s exit from the European Union, the restaurant owner says national policy doesn’t affect him much. “If I give a good product and I open my business on time every day and I am here the hours I say I am going to be here, people can depend on me. And if I know they can depend on me, they are going to be repeat customers,” Trocino said during a short break from making breakfast as workers stop in for their morning coffee. One of those stopping in to pick up sandwiches is Kevin Kundla. The project superintendent at Commerce Construction Corporation recalls how the marine contracting company bounced back after the recession. A registered Republican, Kundla has not yet made up his mind as to whom he will vote for in number, only remarking that he is pro-labor. He says that amid all the talk of Brexit and globalization, the United States cannot afford to go it alone. “I don’t believe that the U.S. should isolate itself, it’s a global economy. It’s a global world. My son lives overseas and I travel overseas to Southeast Asia,” Kundla noted. He points in the direction marine terminal, where containers are arriving from Mexico and China.